The mailing address provided on the Fastbreak/Rapid Rez profile I am registering is correct and I understand it will be used to send me Budget Bucks. • Registration must be completed before 11:59pm December 31, 2019 with a valid RapidRez Number and Fastbreak membership. • Submission of registration shall be consent to opt-in and receive promotional emails and Budget e-Receipt on future rentals. • Using RapidRez number member must complete two fully paid qualifying rentals of two consecutive days or more each between when you opt-in and December 31, 2019 11:59 pm. • Offer valid for U.S. residents (including USVI and PR) renting at participating Budget locations in the U.S. (“Qualifying Rentals”). Non-participating locations subject to change and may not be listed. • After completing two qualifying paid rentals, each registered Budget Fastbreak member will be mailed a Budget Bucks rental reward coupon valued at $25. • Rentals made with any of the following discount codes or profile types will not qualify for the promotion: Budget Pay Now, corporate accounts that do not allow employees to participate in reward programs, Budget direct bill accounts, employee rates for Budget or any affiliated company or licensee, government, travel industry, tour, opaque (i.e. Priceline “Name Your Own Price”), wholesale or convention rates. 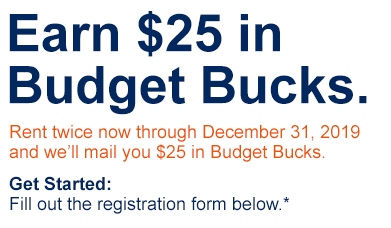 • Rentals paid using a Budget Bucks $25 rental coupon will not qualify for the Budget Bucks program. • Limit one coupon per rental. • Reservation must be made 24 hours prior to pick up. • Budget Bucks coupon will not be replaced if lost or stolen. 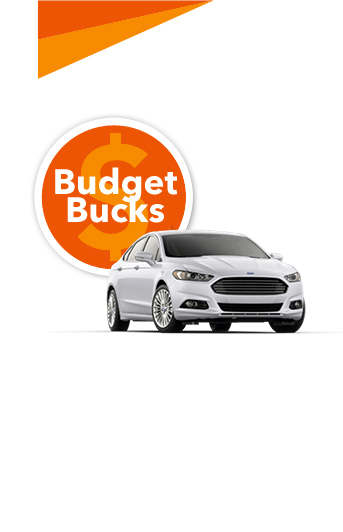 • Budget Bucks coupon must be used before the date listed on your coupon. • Budget Bucks coupon will arrive approximately 8-10 weeks after the completion of second qualifying rental. • Vehicle renter must meet Budget age, driver and credit requirements. Minimum age may vary by location. An additional daily surcharge will apply for renters under 25 years old. • Budget Rent A Car System, Inc. (“Budget”) is not responsible for lost or misdirected mailing of reward or for any malfunction of computer equipment that may prevent registration from being transmitted or received. • Any individual who tampers with the registration process will be disqualified from promotion. • Budget assumes no responsibility for any error, omission, interruption, deletion, defect, delay in operation or transmission, communications line, hardware and/or software failures, theft or destruction or unauthorized access to, or alteration of, registration information, rental data or registrations. • Budget is not responsible for any technical malfunction of any telephone network or telephone lines, computer on-line systems, servers, or providers, computer equipment, software, failure of any e-mail or registration to be received by Budget on account of technical problems, human error or traffic congestion on the Internet or at any Web site, or any combination thereof, including any injury or damage to participant's or any other person's computer relating to or resulting from participation in this promotion or downloading any materials in this promotion. • ANY ATTEMPT TO DELIBERATELY DAMAGE ANY WEB SITE OR UNDERMINE THE LEGITIMATE OPERATION OF THE PROMOTION IS A VIOLATION OF CRIMINAL AND CIVIL LAWS AND SHOULD SUCH AN ATTEMPT BE MADE, THE SPONSORS RESERVE THE RIGHT TO SEEK DAMAGES OR OTHER REMEDIES FROM ANY SUCH PERSON(S) RESPONSIBLE FOR THE ATTEMPT TO THE FULLEST EXTENT PERMITTED BY LAW. • Promotion terms are subject to change. Budget reserves the right, in its sole discretion, to cancel, terminate or suspend the promotion in the event the promotion is incapable of running as originally planned. ©2019 Budget Rent A Car System, Inc. A global system of corporate and licensee-owned locations.